It would seem that my claim — that you are entitled to adhere to any philosophy you wish as long as your conduct does not endanger me, and that we have come to the point where, whatever your philosophy argues, it will most likely endanger me if it is not evidence based and it informs your behavior –has disturbed the force. We have a land full of fundamentalist wingnuts, yes, but perhaps the more dangerous population are the new-agers involved in what I can only suggest is neo-spiritualism (turn about is fair play, I think, as these folk argue that Dawkins et al are neo-atheists.) Unfortunately, these otherwise clever folk offer the likes of Ken Ham steerage when he talks about science being a faith and the value of religion. This is the heavy cavalry in the 21st century attack on “freethinkers” and their calls to arms are that religion not only has great social benefit, but may reflect ultimate truth. And the more comprehensive the argument that there is no demonstrable validity to either claim, the more virulent the attack. 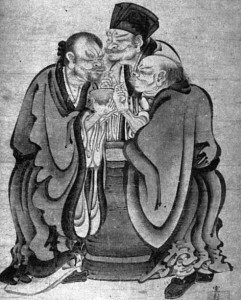 The Sarewitzs of the world are more dangerous because they present as plausible the logically inadequate and inconsistent as acceptable to the scientific mind, they provide religious nonsense with a stamp of modern approval and somehow suggest that Eastern religion and quantum mechanics are coming together to form a new cosmic understanding. Om mani padme humbug. The problem, as I attempted to put it in the first paragraph, is that we no longer have the time or space to allow people to do moronic things. Trusting in magic in a closed system with a lit fuse is not acceptable policy. Now, I have to admit that the pendular argument has something to offer, and while I am horrified by the constant attempts to analogize science to philosophy the physics of harmonic motion (periodic motion where the restoring force is directly proportional to the displacement) do offer some food for thought. Is Q’uranic patience, Dao-ist acceptance, best practice? Shall we smile, fools on the hill, as the lemmings throw themselves off the cliff, until the wheel turns? I don’t know if I am equipped for dung heap sitting, certainly not without substantially more meditation. And of what use is the argument for an evidence based ethic, if we are condemned to suffer the slings an arrows of outrageous harmonics. Blankenbicker, Adam. “Why I Don’t Believe in Science…and Students Shouldn’t Either.” Sci-Ed, September 2, 2013. Accessed February 20, 2014. http://blogs.plos.org/scied/2013/09/02/why-i-dont-believe-in-science-and-students-shouldnt-either/. Coyne, Jerry A. “No Faith in Science.” Slate, November 14, 2013. 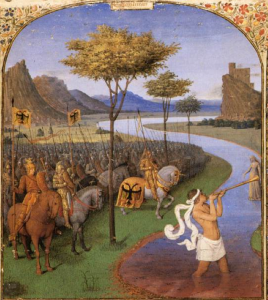 Accessed November 29, 2013. http://www.slate.com/articles/health_and_science/science/2013/11/faith_in_science_and_religion_truth_authority_and_the_orderliness_of_nature.html. Herman, Joan L., Ellen Osmundson, and Ronald Dietel. Benchmark Assessment for Improved Learning. An AACC Policy Brief. Assessment and Accountability Comprehensive Center, 2010. Taleb, Nassim Nicholas. The Black Swan the Impact of the Highly Improbable. New York, NY: Random House, 2005. One of the problems facing anyone trying to discuss much of anything about education is the question of just what education is. As I have suggested elsewhere, while I have a very clear idea of what education is, your very clear vision may be different, and we have yet to even get to those who have little or no vision. But how, I have been pondering, might someone explain what education might mean to someone who might not have been the beneficiary of an education? And it was at that point that I had a delightful bit of travel (without ever leaving my seat) that seemed, in part, to answer that very question. And I thought I would share that with you. 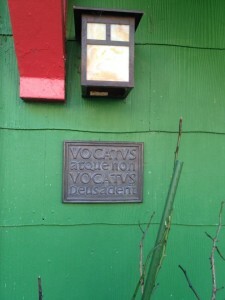 which translates in Latin to, “Called or not called, God will be there.” What is the source of this curious statement? It turns out that this text is copied from a famous doorway in Kusnacht, Switzerland. 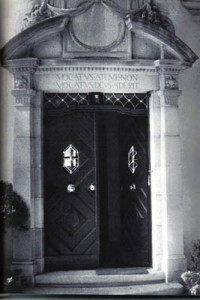 Carl Jung, the 20th Century psychologist, had the Latin carved in to the stone above the door of his house in Kusnacht. an ear, and frees the poor man, his labours done. Photo borrowed from JungNewYork.com (sources unknown). The panel on that doorway is just another ironic cast (yes, it is a bad pun, but I am going to continue to use it…) The plaque of course is not iron, but what is ironic is that anyone, having read Horace’s Ode condemning vain riches, would be so clueless as to carve the source of Horace’s skewering on their lintel, let let alone nail it in in brass (now that is ironic) to their door. “Does any of this have anything to do with education?”, you might well inquire. My point in traipsing through time and space was to demonstrate that as a direct result of my education I undertook that journey. An “explore” is a lifelong journey, teaming curiosity with discipline, which enriches each life so engaged, and those touching them. Croix, G. E. M. de ste. The Class Struggle in the Ancient Greek World. Ithaca: Cornell University Press, 1981. I recently had a tutee complain bitterly about an teacher marking down papers because the papers did not comply with the instructors perspective on a particular style manual. It is not the first time for pompous declarations on all manner of style issues, and this time, I though I would follow through and pose the question presented to the style experts at the APA. So, dear instructor, perhaps you had best reconsider? “I believe we should take direct steps to maintain a free public education not encroached upon by any quarter. I think it might be well to bring out in the argument for the direct or indirect benefit of public funds for education is the matter that is now being faced in Europe and in particular in the Netherlands where they have what is called the form of educational pacification, where the government is splitting the tax dollar among some 500 different church groups providing for a parochial school benefit on an indirect basis, and in a community where there is maybe 500 school children there will be as high as seven or eight small schools scattered out throughout the community, not providing for the fullest benefit in the educational field as far as having a good complete centralized program. I think that sectarianism segregation in our educational system is bad for the children. I do not deny the right of people to have their own schools. However, I think that we should always look to the interest of the founders of our nation when they brought about the separation of church and state.” Jack Coghill Floor speech quoted in full with cite below. Constitutions are, as Jefferson might suggest, sacred not so much for their text as for the compact they represent, our oath that as a society we will strive for the common good. That sense of responsibility is in fact the reason that there are among us those who signed our Constitution who have argued that no matter what else, the power to amend our Constitution should never be used in such a way as to rend asunder that which the Constitution has brought together (see quotes of Jack Coghill, Sr. and Vic Fischer, below.) Unfortunately, the Alaska Senate is engaged in just such a consideration this session. Let there be no doubt that Joint Resolution 9 is not about rectifying historical faux pas, nor is it about rectifying an “old mistake”. But the underlying purpose, as distressing as that is, almost pales before the grief that this resolution is intended to bring to the people of this State. For this is in a very real sense a cynical ploy; an effort to do just what we should never do. This is an effort to drive a wedge through the heart of Alaska. This is designed to promote the most vitriolic clash in Alaska’s history, to rend our very soul in twain, and is is being done, believe it or not, in the name of Alaskan youth. For shame. There are Alaska Senators who believe that they should use the Constitution as a political weapon, a device with which to promote their political agenda, not because it is in the best interests of all, but because they think they can get one over on someone else and get their way. In a 1996 article for the Atlantic Monthly about Jefferson and about the true nature of America’s “civil religion” (a far cry from the Protestant intolerance informing the positions of many in Juneau today), O’Brien states, “In an address at Michigan State University on May 5, 1995, President Bil Clinton warned right wing militias not to attempt to ‘appropriate our sacred symbols for paranoid purposes..” And that it is what we face today. But the Alaska Legislature does not represent the interests of some Alaskans. It represents the interests of ALL Alaskans, and I have to ask the Legislature, in all sincerity, if they truly believe the horrific politicization of education that this resolution would unleash is going to benefit Alaska. We do not live in a democracy. Indeed our founding fathers were terrified of democracy as well they should be, schooled as they were in Greek Philosophy. Instead they fashioned a republic specifically designed to prevent demagoguery. Specially fashioned to insure that popular passion would not result in momentary advantage. In order words, to protect us from what the Legislature is here asked to unleash. outside advertising intended to destroy public employee unions and public education. It is about the Texification of Alaskan education. I call on all Alaska Senators to uphold that redemption offered by our Constitution, and acknowledge that the Alaska Constitution, that organ of unification, must not be used as a means of shattering the public trust or confidence in its public institutions. O’Brien, Conor Cruise. “Thomas Jefferson: Radical and Racist.” Atlantic Monthly, 1996. Accessed March 27, 2013. http://www.theatlantic.com/past/docs/issues/96oct/obrien/obrien.htm. Simple is as simple does…. There has beena good deal of tooth grinding about the current ASD budget gap, some of the ideological rants, some well intentioned efforts to focus the public eye on various issues. An example of the latter can be seen at ElectronicBonsai , David Block’s Blog. Tip o’ the hat to David in that he is generally accurate, but his conclusion unfortunately is not – there is no “simple” answer to ASD’s budget woes, in no small part because it is, at its base, a political problem and our politicians are doing a Tastes Great/Less Filling on us, and we continue to drink the slop. Certainly bringing back the BRT system would increase community involvement in the budget on a more granular level. In fact, I served on BRTs during every cycle since they were implemented by Carol’s predecessor and we in fact help cut millions from ASD’s budget (mostly mission creep, as opposed to waste.) But any number cruncher will likely tell you that while the BRT system will give the community a better sense of what is in the budget, it is fairly obvious where cuts can be made, and we are likely not going to go there…..
On the other hand, David’s use of the term “infiltrated” with respect to federal education programs is unfortunate. As David Teal suggested (repeatedly, as it were, on LegTV) the State would have implemented the same programs as the Federal government offered financial incentives to pursue, so while an easy target for whiners, there is not much to complain of there. However, we should note that ASD has never fully complied with many policies that bring in Federal funds, but has always continued to receive those funds while they are afforded substantial room to move inside grant scoping parameters. But grants come with overhead and, as David correctly notes, run dry. 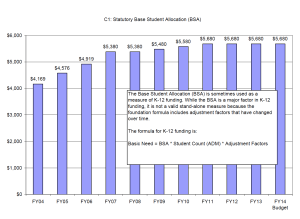 One might even argue that Alaska School Districts should look at running their base functions off the base student allocation to avoid the boom and bust cycles that Ms. Comeau used to her advantage over the past decade to erode teacher compensation. But as most everyone will agree, that would be virtually impossible. Books, though, could be cut with a bold turn into the headwinds of the 21st Century. But while we’ve wasted millions on technology that really won’t help, we have spent little on technology that could help. And while Mr. Steele, while a Board member, actually suggested that turning the Tech BRT into a standing District body might produce long term benefit, that idea was quickly snuffed when it became apparent that the BRT was not going to be led about quietly…. But even the savings that could be realized from appropriate technological policy won’t make a dent in the hole artificially created by our leading lights. If one looks at budget expenses over time you see that adjusted for inflation what goes in to the classroom has not changed much over a decade, while overall spending has risen sharply. And most of that rise is attributable to low cost bonds pushed by the current and past administration for construction and administrative costs (which go far beyond just a few extra ineffective unit administrators.) In other words, the folk who are complaining most about the current cost of education are largely responsible for the cost sectors that they are whimpering about. And in the meantime, what most of Anchorage seems to forget is that most of us make no net payment for any State or local service. Let’s say that again: “most of Anchorage seems to forget is that most of us make no net payment for any State or local service.” The “taxes” that David references are offset by payments from the State to the populace, so from an accountancy perspective, we are being paid to pay our taxes and cry pitiably should anyone suggest that we actually reach into our pocket for a sous more. We have made our bed and now it is time to lie in it. At the local level we have a fractured and polarized community, and we elect to the Board far right ideologues (who simply want to shut down public education and public employee unions) like Don Smith and centrist nodders who purport to be in support of public education and then give the nod to whatever looniness central administration runs up the flagpole (like Jeff Friedman who thought it was just fine that ASD should violate State law with respect to teacher credentials.) The current crop is so ineffective that none of them have apparently demanded that staff publish the working documents used to develop the scandalous e-mail that went out referencing a change from 6 to 7 periods, though the public asked the Board to make that information public 3 weeks ago. We have municipal administration that believes it can run roughshod over the community because it has an extra vote in the Assembly and we have a State government that is controlled by people who are approaching delusional. In a very real sense, the source of our problems is the focus of our problems; we have so poorly managed public education that we have failed to produce what public education is intended to produced, an literate and informed public that can parse logic and rhetoric to engage in critical thinking for the purpose of making rational decisions. In fact many are trying now to gut our Constitution so that the State will fund “schools” that promote instruction in the supernatural while they applaud Mr. Ham and Creationism! Is that the fault of teachers? Well, far be it from me to argue that we don’t have more than a few rotten apples in the barrel, but that even the best teacher faces an impossible task with the odds we have stacked against them. But while Evaluation under The Danielson Group will require teachers to spend more time in peer review, reflection and lesson planning, they will be provided less time to do that, increasing class sizes (though class size should be halved), and reduced respect and compensation. The rational response to all this might be to follow the age old advice to put the shovel down and back away from the hole, but that is not likely. What we are going to do is get very angry and scream our way into a few extra bucks, which in the long run will not in any way address the issues underlying our problems. The “simple” fact of the matter was well framed when Senator Dunleavy recently inquired of Superintendent Paramo regarding SJR9. Paramo ducked the question. And that is what our big school districts are all doing about State funding, they are all ducking. They use State politics to batter teacher negotiations. They throw up their hands and say, “It is out of our control!” instead of saying, “We are shutting this fiasco down because this entire discussion is ludicrous.” It is high time for local school districts to choose, because we all know that otherwise the choice is made for them, and that choice results in lots of people employed doing little more than babysit.